Dedham Vale with the River Stour in Flood belongs to a small group of Constable’s early Suffolk paintings remaining in private hands. The work will be offered in Sotheby’s Old Masters Evening sale on 6 December, with an estimate of £2 - 3 million. “Constable’s views of Dedham Vale and the Stour valley have become icons of British art and define for many everything that is quintessential a bout the English countryside. Dedham Vale with the River Stour in Flood was long mistakenly thought to be by Ramsay Richard Reinagle (1775 - 1862), a friend and contemporary of Constable’s, but recent scientific analysis and up - to - date connoisseurship has unanimously returned the work to its rightful place among the canon of the great master’s work and established beyond d oubt its true authorship . It is without question one of the most exciting and important additions to Constable’s oeuvre to have emerged in the last fifty years”. This rare masterpiece depicts the area of the Stour Valley around Dedham Vale, on the border between Suffolk and Essex where Constable spent his boyhood years and which has become synonymous with the great painter. and The Leaping Horse, 1825 (Royal Academy, London). 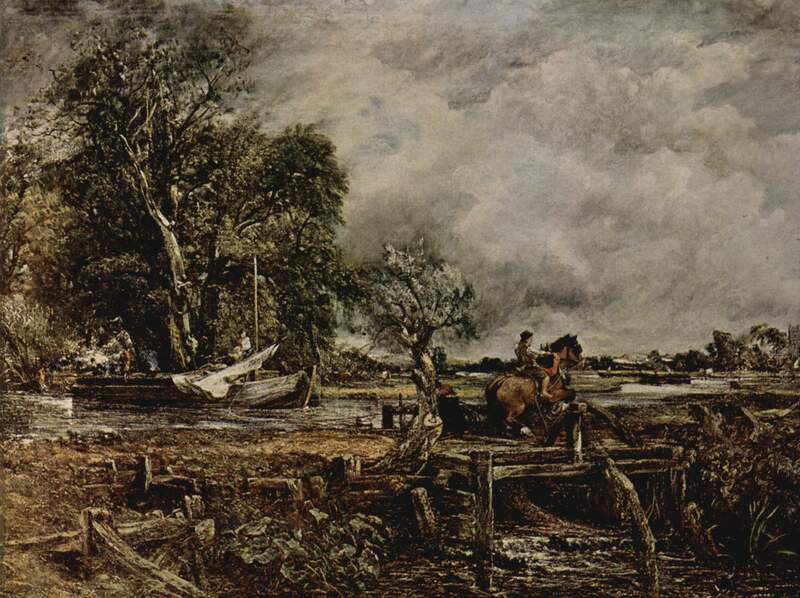 The works belongs to a group of paintings similar in size and style that Constable painted between 1814 and 1817, all of which are views of the Stour Valley and the area surrounding East Bergholt. These works were painted partly on the spot and show the artist’s commitment to naturalism at its most faithful. Whilst the painter’s later works tended to be purchased either by Constable’s great friend John Fisher or by patrons or dealers with metropolitan or international connections, the earlier Suffolk paintings tend to have closer associations with patrons or friends in the local area. This painting is thought to have been commissioned by Thomas Fitzhugh as a wedding present for his future wife, Philadelphia Godfrey, the daughter of Peter Godfrey who lived at Old Hall, East Bergholt and was a near neighbour and friend of the artist's family. The view is taken from the bottom of her parent’s garden, looking out over the valley with the river in flood, a symbol of fecundity, and was intended as a memento of her childhood home for her new married life in London. 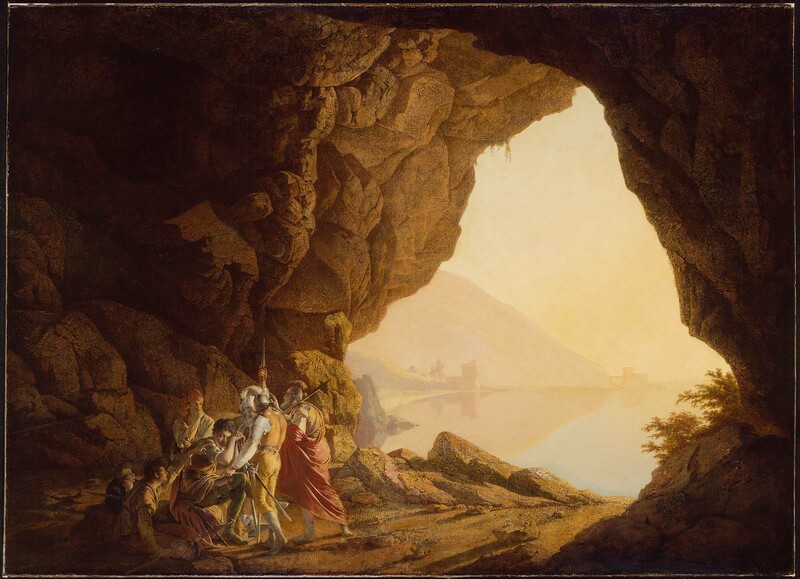 The genius of Joseph Wright of Derby A.R.A. (1734-1797) will come under the spotlight this winter, when one of the artist’s most important candlelit pictures, and one of his last major works remaining in private hands, appears at auction at Sotheby’s. Joseph Wright of Derby, A.R.A., An Academy by Lamplight Oil on canvas, 50 by 40 in. (127 x 101.6 cm), est. £2.5-3.5 million.Courtesy Sotheby’s. Painted in 1769, An Academy by Lamplight is a supreme example of Wright’s dramatic rendering of light and shade and his association with the Enlightenment movement. Almost certainly the picture that Wright exhibited at the Society of Artists in 1769, this rare painting was first securely recorded in the collection of Sir Savile Crossley, 1st Baron Somerleyton (1857-1935), the scion of a great carpet manufacturing dynasty from Halifax, and has remained in the possession of his family ever since. One of the star lots of Sotheby’s London Old Masters evening sale on 6 December 2017, it will be offered with an estimate of £2.5-3.5 million, the highest estimate for a work by Joseph Wright of Derby ever at auction. and A Grotto in the Kingdom of Naples with Banditti (Museum of Fine Arts, Boston) have become icons of British art the world over. the other version, painted in 1770, was acquired by Paul Mellon in 1964 and is now in the collection at the Yale Centre for British Art, New Haven. 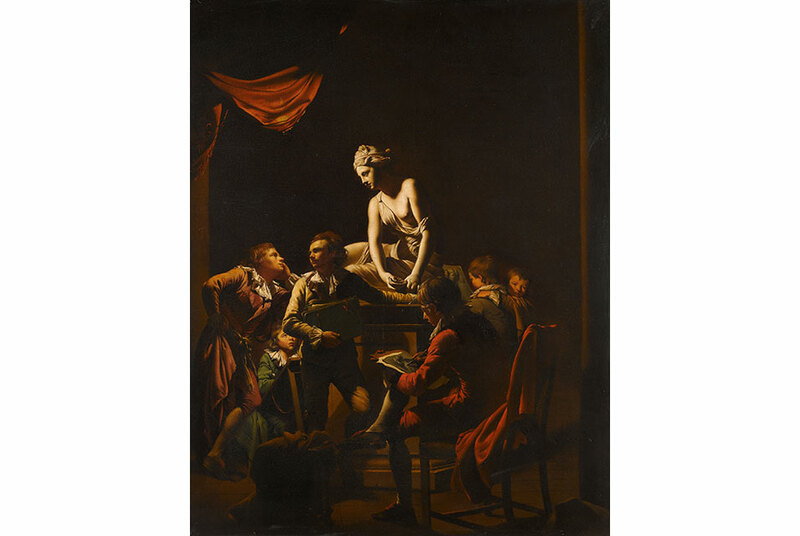 In An Academy by Lamplight, Wright of Derby tackles a subject with a long and illustrious history dating back to the first academies of art established during the Renaissance in Italy. Wright may have been inspired by the profusion of such organisations in 18th-century Europe and especially in Britain, where the Royal Academy in London was founded just a year before the work was painted, in 1768. 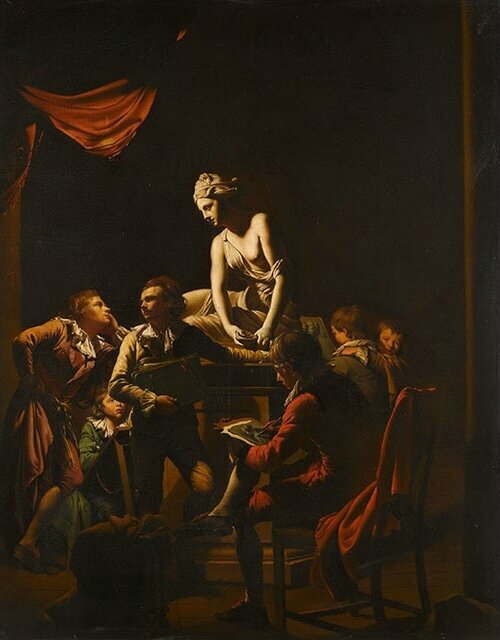 The work depicts six young draughtsmen contemplating the cast of “Nymph with a Shell”, an antique Hellenistic statue much admired in the 18th century when it was housed in the Villa Borghese in Rome. Today it can be found in the Louvre. Wright was closely associated with the key members of the Enlightenment and, in particular, with the group of scientists and industrialists who made up the intriguing 'Lunar Society'. A peculiarly 18th-century fusion of science, the arts, philosophy and literature, the Society’s members challenged accepted beliefs and pushed the boundaries of scientific and intellectual exploration, counting among its members leading figures like Josiah Wedgewood, Matthew Boulton, Joseph Priestly and Erasmus Darwin (grandfather of Charles). Though Wright himself was never officially a member of the Lunar Society he was intimately bound up in that world of intellectual, scientific and commercial enterprise and drew succour from its activities, which forms the spiritual core of his art. Wright of Derby's 'candlelit' pictures, with their dazzling use of chiaroscuro, are in many ways the artistic manifestation of the intellectual endeavours of these luminaries of the Enlightenment: the introduction of light into darkness acting as a metaphor for the transition from religious faith to scientific understanding and enlightened rationalism.